Head over to to the AQW Facebook Page and guess the identity of this deadly AQW monster! Your domain (AQ.COM) is NOT one of the domains where we have discovered exposed data in any third party caches. The bug has been patched so it is no longer leaking data. 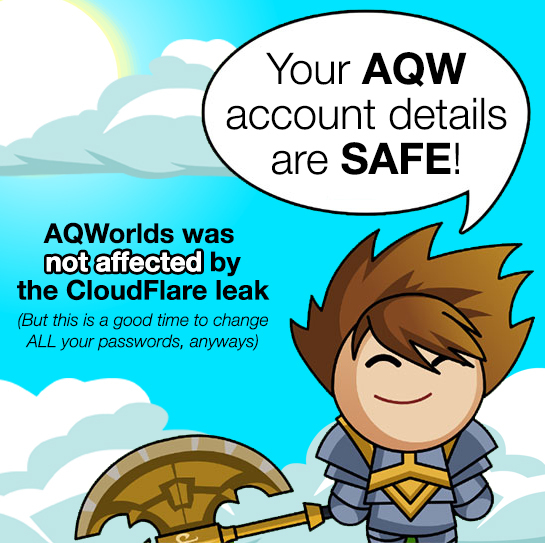 There is no evidence of any leaked AQW information, but if you are concerned about your own AQW account safety, please consider changing your game account password. A benefit of updating your password, is that it will be re-encrypted with a higher encryption setting than the default. The Blood Samurai leaves Friday, March 3rd! 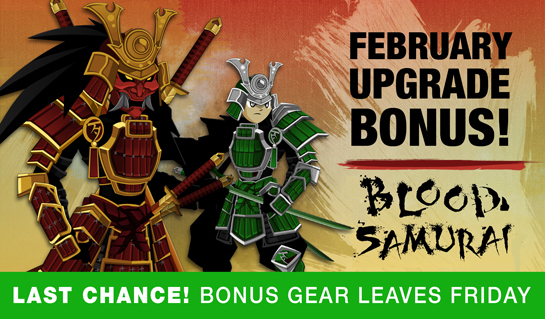 Unlock the Blood Samurai set when you buy any membership or AdventureCoin package worth $10 USD or more until this Friday, March 3rd, at 6 PM EST. 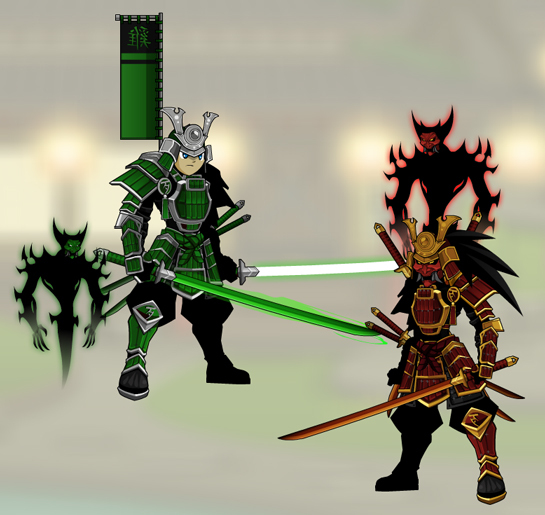 Upgrade with a 12000 AdventureCoin or 12 month membership to get the Jade Samurai set, too! By decree of the Warlord of Yokai Isle, only the truest, bravest warriors are worthy of equipping the Blood Samurai gear. By decree of the Emperor of Yokai Isle, only the noblest, most loyal warriors are worthy of equipping the royal Jade Samurai gear. Nythera is the head of the Player Support team. She and her two battle-companions, Neveya and Vidra, are here to help all our heroes whenever they have account issues. But because the world of Lore can be dangerous, we have certain rules all our players need to follow - they help everyone play friendly and fair, and help keep you safe. 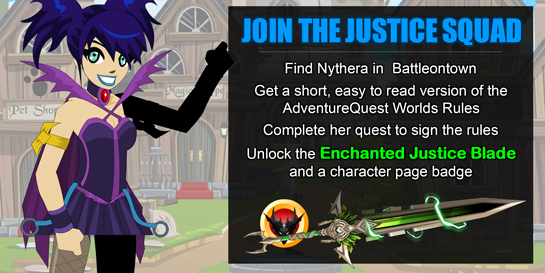 To make it easier for everyone to find and know the rules, Nythera is now parked right in the center of town with a basic list of rules, a quest, and an achievement. Enjoy playing AQWorlds! Do not bot, cheat, or use any programs to help you play. Keep your account safe. Do not share, trade, give away, or sell your account. Keep your password secure. Do not share it, or ask anyone else for their password. Be friendly! Do not harass, insult, or threaten anyone. Do not upgrade other players' accounts. Buy them a gift certificate instead! 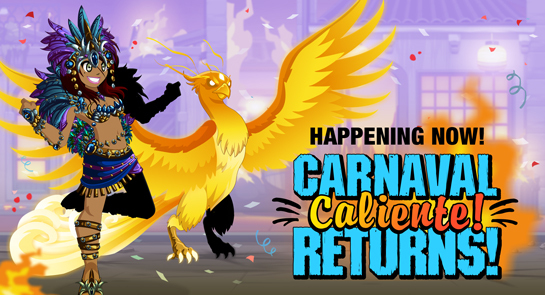 It's time to get your /party on as Carnaval returns! /Party with your fellow heroes as we return to last year's multi-cultural parade bash ... but beware - when an old villain decides to celebrate this year... things may just get too hot to handle! 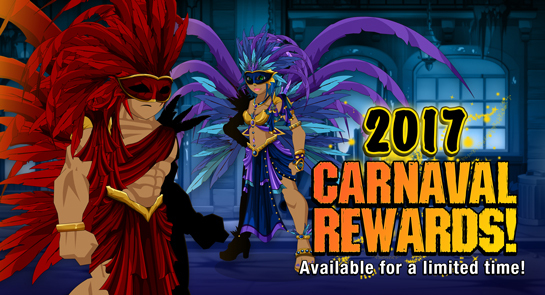 This weekend, head to Carnaval for all your favorite party gear! 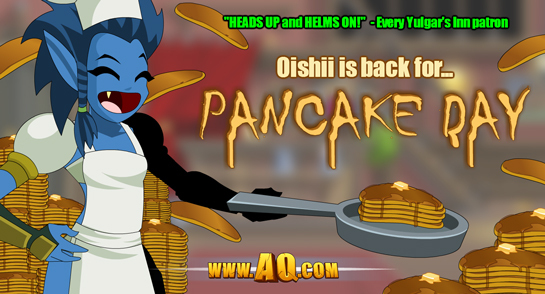 Many thanks to AQW team member Ergotth for designing the release and doing the Portuguese translations! It's Not a Party without Presents! Head to Terra da Festa to find our favorite seasonal Carnaval rewards, plus a host of new items! Tip your tophats to fellow AQW hero and Brasilian artist extraordinaire, daniel_pp2 - his Caliente Carnaval armor set inspired this year's reward series! 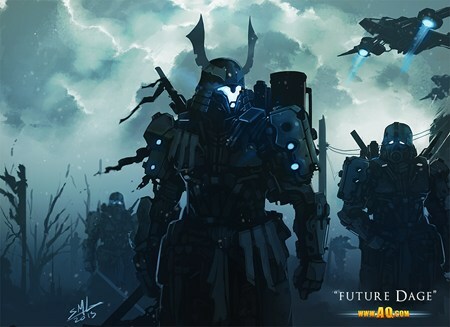 In this inspired painting by www.AQ.com artist, Dage, we see a glimpse of the distant future.... where an army of soul powered mechanized Samurai battle a mysterious and unstoppable force upon a post-apocalyptic world. Dage grew up playing the original AdventureQuest and other Artix Entertainment games. He was a regular on the forums and posted his 2D weapon and armor art reguarly for the team to see. Impressed by Dage's growing skill and persistance, Nulgath took him on as an apprentice. It was not long before Dage's artwork made him a fan favorite. We offered him a full time artist position and he moved to work with us here at the lab. His story is very similiar to many of the incredible artists who build the games with us. I walked into the lab yesterday and saw Dage drawing a sketch of the image posted above. He said, "Check this out... todays warm up painting." He worked on it for an hour or so. When he switched to working on the AQWorlds items you could tell he was thinking about his painting all day. Around midnight last night I get a text on my phone. It just said "Future Dage" and had the picture above. For the past year, Dage has been focusing on his painting skills because he knows that the future of our games, both 2D and 3D will require artists with strong painting skills. Of course, no one told Dage he needed to do this. In fact, I have never given Dage a painting asignment. He has created all of the paintings that you have seen posted over the past year because "he just had to." And for those of you seeking a career in art, I urge you listen carefully. Do not wait for someone to tell you to make something. If you feel that need inside you to make something... do not hesistate, start making it immediately and force yourself to finish it. Spend your time looking at the type of artwork you want to create. Let yourself get mad because your artwork does not look that good... and study, read, and keep trying different things until you create artwork better. Someone once told me "...being an artist requires sort of mental illness." If have a super human passion and motivation is an illness, then please tell me how to get infected! Dage's Undead Legion 3017 War Continues Friday, March 10th! The battle to control the future rages on as Dage the Evil fights to survive aboard the Dreadnaut! Get previews and discuss the event with your friends on Facebook page! 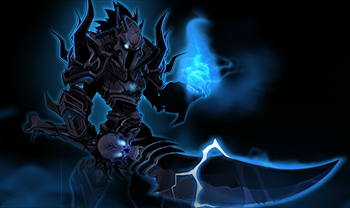 Dage's Undead Legion 3017 event now has a Facebook page! Get previews, discuss the coming war, and invite your friends. 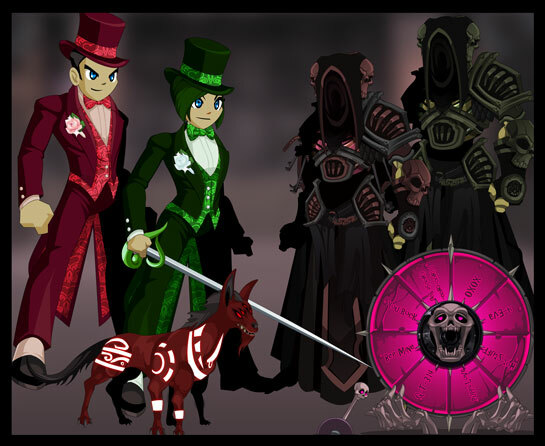 ** Last year's rare gear, including the Arcane Dark Caster, will not return. This armor set will likely come later in the month of March. Stay tuned for a release date. 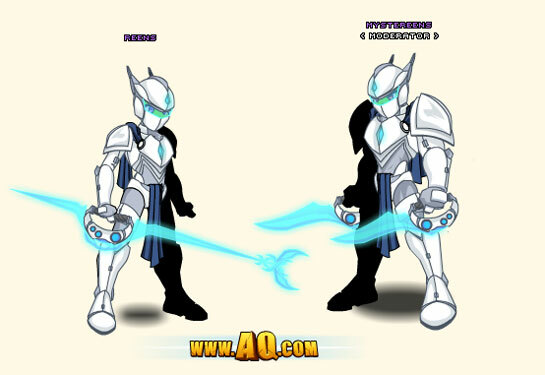 Note: The original Sepulchure's DoomKnight Armor is not required to get the Legion DoomKnight Class. Since we've received reports about classes being weaker on the new server AND Dage's birthday is coming soon, we are sending the LDmK to the front of the list for adjustments to make sure it stays as useful and competitive as it is been on the current server. The Legion DoomKnight is a wicked class, and you guys love it. We want to keep it that way! 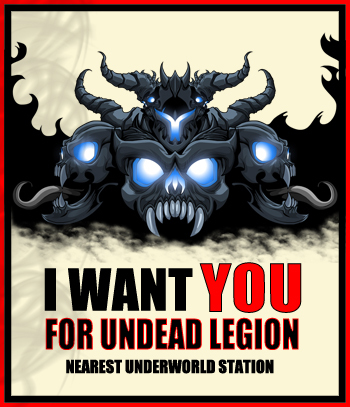 Are you a member of the Undead Legion? Death, darkness, and destruction - all are hallmarks of a Legendary member of the Undead Legion! If YOU think you are worthy of the title "Undead Legend" then head to Shadowfall and seek out Dage! Members of the Undead Legion get pretty sweet benefits... FOR ETERNITY (/spooky voice) - including exclusive quests, Legion Token variants for many of Dage's popular new items, and more. If you aren't a member of the Legion NOW but you bow down to the Darkness (or just like awesome-looking gear), this is the time to join! 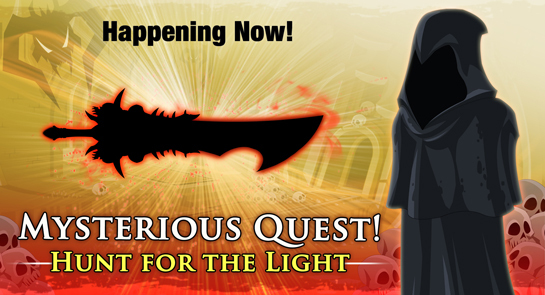 Assuming you’ve made it this far, you can complete lots of other quests from Dage, gain access to Dage’s Soul Forge where MORE items can be crafted, and also be fully prepared for the brand new gear arriving next month! Hello! 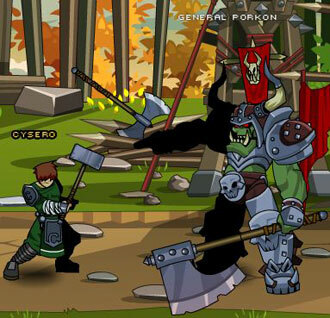 Hidden in various parts of AQWorlds are small, hidden side adventures or battles. We like to build these surprises for you to find because that makes the world feel more full and fun. On Friday, we released 2 surprise bonus quests - one from Twilly in Battleon, and the other... well, you'll just need to find it! The problem was - anyone trying to complete Twilly's Dark Box quest between 6 PM Friday night and Saturday at 1:30 AM had to turn in 2 items from the "Open Treasure Chest" quest to get a reward... but weren't guaranteed to get anythnig, much less the low drop rate reward they were after. Later that night, we adjusted the quest rewards so that all rewards had the same chance to drop. BUT that didn't solve the problem of players who had spent a ton of ACs. So if you were one of the 148 people who turned in more than 5 Treasure Chest Keys before the quest fix went in, your AdventureCoins will be refunded. Twilly apologizes, and so do I. From here on out, you will need to have 1 Dark Box and 1 Dark Key to begin the quest, but you will only need to turn in 1 Dark Gem to complete it. For the 288 of you who turned in Dark Keys/Boxes after the Saturday quest fix but before today's change, you'll get an AC refund, too! Lord Balax'el is a scion of the Darkness, leader of the Infernal Army invading Lore to help the Queen of Monsters fulfill her goals. For those who aspire to be like him, you're in luck! 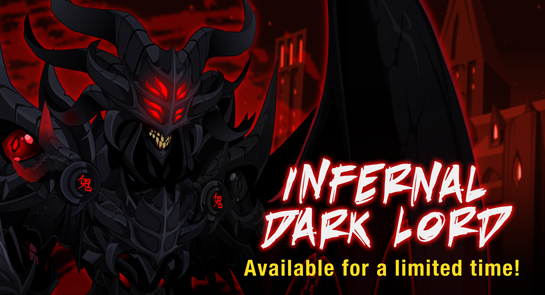 The Infernal Dark Lord armor set is now available! The Queen of Monsters' Saga Continues in Dreadfire! Some of you may remember the mysterious shop vendor in Dreadrock city (a home for dark and villainous heroes of all kinds) selling what appears to be Infernal Army gear. Good eye! If you talk to him again, he'll explain that he found that gear left by some pretty shady characters as they scouted the city... but left their gear behind. Now, you'll get to meet the creators of that gear as you battle through the Infernal Army's home. And the gold you spend on it will go to fund their dark and deadly campaigns. 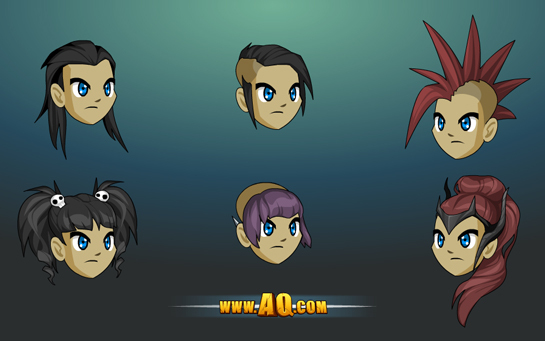 Talk to Skamedar in DreadFire Keep to choose from one of six new hairstyles! And, if you dare, convince Tasom that YOU are the perfect guardian for one of... its (we can't really tell WHAT gender Tasom is)... new pets. Fans of OverSoul may recognize the monsters above - these three snuck into OUR world from the lands of the OverSoul the last time we opened a portal there. 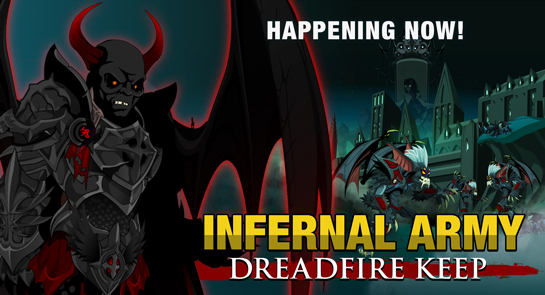 Captured by the Infernal Army, these luckless creatures have been trapped in the Dreadfire dungeons to await tasty HeroSnacks! Do YOU want to join the Infernal Army? Make no mistake about it, the Infernal invaders are the BAD guys -- these are your enemies. But sometimes, you've got to make nice with your opponents in order to gain their trust and learn their secrets. If you're up for going undercover and... bending the truth of your allegiance... you'll have the option of ranking up an additional Dreadfire reputation: Dreadfire Militia. Starting this Friday, talk to Malurach in Dreadfire Keep! Seasonal Event Items Arrive this Friday! Love might be its own reward, but we don't think that's not enough for OUR heroes! Find all-new event rare gear in the February Featured Gear Shop in your game menu, plus over 20 new reward items dropping from this year's new quests and monsters! * Complete the release to unlock! 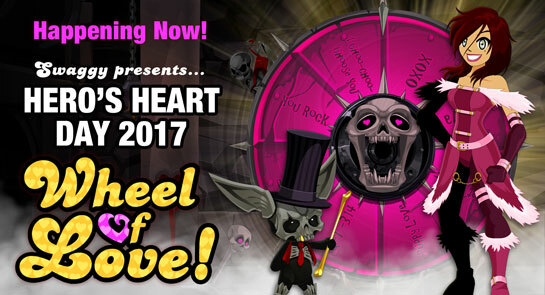 The seasonal event gear will be available until March 3rd (unless you have the Wheel of Love house item, then you can access that quest all year long). The February Featured Gear shop will also leave on March 3rd. 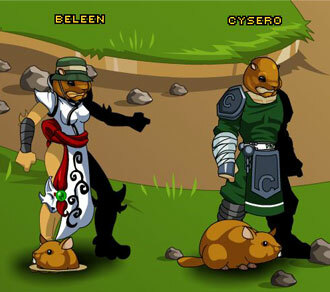 This weekend, join us as our seasonal Hero's Heart Day event returns! Plus, find an all-new adventure: Swaggy's been hired to put a new spin on the oldest game in the world! Along with Beleen, he'll put on a show like Lore's NEVER seen - and in the end, one very lucky and special contestant may find the best prize of all -- LOVE! 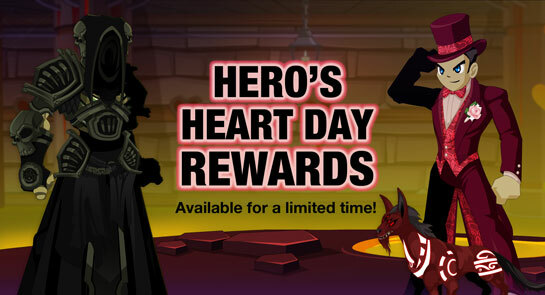 To help all our AQW Heroes celebrate Hero's Heart Day, when you log in this weekend, you'll get 15% more Gold and XP! Log in during the Half-Time Show to Punt Twilly! It's the biggest American Football game of the year! 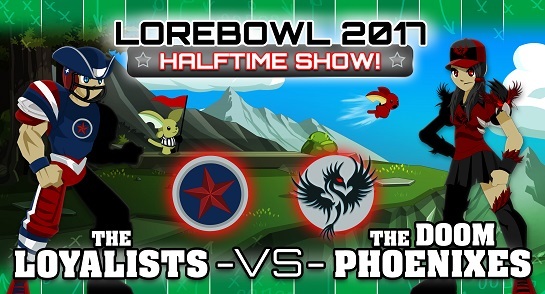 * On Lore, the Loyalists and the Doom Phoenixes (what the real world knows as the Patriots and the Falcons) are preparing to face off! After the 2nd Quarter ends, the Superbowl halftime show will begin... and so will our special event! When you've had your fill of watching Lady Gaga rock the stadium, Log in and head to Battleon for our once-a-year PUNT TWILLY minigame! Don't forget that this is the ONLY time of year that you will be able to get the Moglin Punter Character Page Achievement Badge and all you have to do is kick Twilly the full 100 yards! Hunt through Darkness for Light this Weekend! A Mysterious Stranger has appeared in ShadowFall with a quest for you - one that requires intellect as well as raw battle skills. Decode his clues to discover where your quest will lead, then take on the enemies there to gain the material necessary to complete the reconstruction a long-lost reward! OOC (Out of Character) Warning - this means that what YOU are about to find out, your in-game hero will not know. You can talk to this Mysterious Stranger RIGHT NJOW in ShadowFall and follow his clues. Find (or fight) what you need to in order to get the pieces necessary to create a VERY special golden blade... something required to reforge an even MORE important (and powerful) weapon! Dark and deadly reward drop from this weekend's boss fight! WHY is the Mysterious Stranger Involved?! Good question! Short answer: he's not... maybe. Long answer: Mysterious people have mysterious motives. But really, we have seen a number of Mysterious Strangers over the years -- humans, creatures, or "other" who -- for whatever reason -- don a dark cloak and call themselves "Mysterious Stranger"* (It is pretty hard to see under that cloak to tell them apart!) And hey, you never know. THIS one might be trying to help you, maybe. Probably! Inanitas, a crazy-insane and creative member of the team, came up with the concept for this hunt! If you are *really* stuck on where to go during this hunt, you can ask him gently on Twitter or collaborate with each other on the forum! * Like the one from last year's Throne of Darkness Saga! GroundHorc's Day 2017 is Here! If you Live in Australia... at least. For everyone else, bookmark this post and read it tomorrow. (Or, if you're a rebel, read it now and insert "tomorrow" where the text below talks about the present.) For all you heroes who live in the future... Happy GroundHorc's Day! 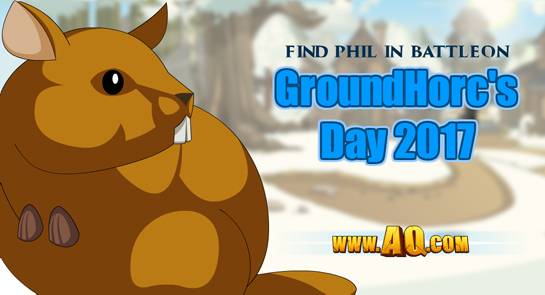 On this day every year, Philip, the weather predicting groundhog pops his head out of his hole and peers around. If he comes out to play, then spring is here! If he sees his shadow and vanishes back into his warm, cozy burrow than we know that we are in for SIX MORE WEEKS of winter! I'm not a fan of the cold. Actually I kind of hate it. Actually I really hate it. Actually, I'd beat snow up if I could. But if there is one person who HATES winter more than I do, it's General Porcon over in the Horc Fort (you can see it on the greenguard map). He has taken it upon himself to kidnap Philip in a desperate attempt to end winter. What he doesn't understand is that if Philip doesn't get to look at his shadow then winter will NEVER end! 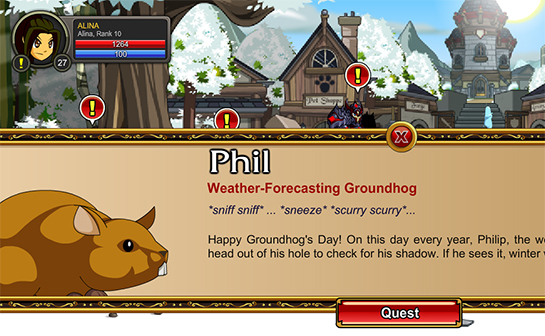 Talk to Phil in Battleon and accept the Groundhorc's Day quest to save Phillip and you will recieve at least 1 (possibly all three) of the Groundhorc's Day 1-Day-Only Seasonal Rares! 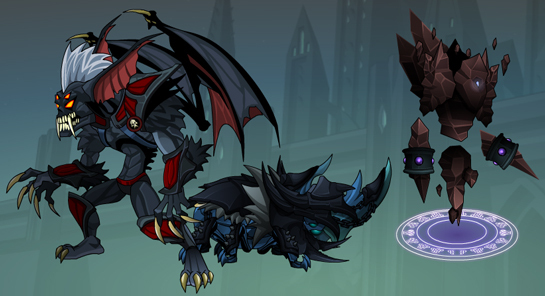 The clock is ticking on a lot of things: Nulgath's Birthday Shop leaves Friday, the January Upgrade Bonus Gear Friday too, and in exactly ONE MONTH from this Friday, Dage's birthday shop arrives! AND this Sunday is the Superbowl halftime Shop and Punt map (with special rares to celebrate the Loyalists and and Doom Phoenixes).